Skinnygirl is Shaking up an Array of New Cocktails! Great tasting, naturally sweetened and low-calorie with each sip has been the basis of each Skinygirl beverage, founded by TV Star Bethenny Frankel, Skinnygirl has paved the way for low-calorie beverages with a great taste! 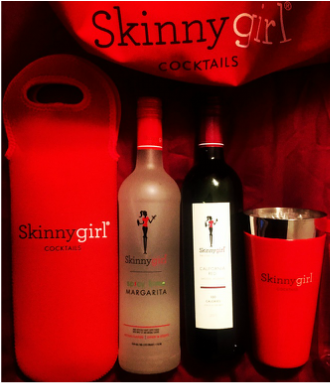 The Skinnygirl collection consists of a range of beverages that include, Vodka, Wine and a large Ready to Serve Cocktail Collection. Two new products that recently hit the shelves are the Skinnygirl Spicy Lime Margarita and the Skinnygirl Pinot Noir. The Skinny Girl Spicy Lime Margarita is the perfect blend of lime, spicy chili and tequila. It provides a sweet kick and at only 100 calories per serving you can afford to have more then one glass! Skinnygirl Spicy Lime Margarita is 19.9 proof and offered in 750 mL ($12.50) and 1.75 L bottles ($19.99). The Skinnygirl Pinot Noir contains aromas of dark cherry, toasted oak and vanilla. At 100 calories per 5 oz. serving this wine is something worth cherishing! Skinnygirl Pinot Noir is 10% ABV and offered in a 750 mL bottle ($11.99). The Skinnygirl Pinot Noir is perfect to pair with a nice meal.